The cyberspace is heating up with cyberwar. Attacks by hacktivists are increasing in numbers and capacity. Today, on April 7, a hacking group had called for a united attack on Israel which is well under way. The operation was code-named ‘#OpIsrael’. The attack is well underway as many Israeli websites run by corporations and government came under attack. The group behind the call of attack is named as ‘Anonymous’. The group has previously also carried out the attacks against Israel under the same code-name in November 2012 when Israel assaulted the Palestinians. In that operation more than 700 websites were taken down by the group which included websites of ministries and Israeli President’s official website. In response to the call, many hacking teams from around the world are taking part in this attack. They are: Mauritania Attacker , Virusa Worm, Deto Beiber, Dr.SaM!M_008, M3GAFAB , Extazy007, PhObia_PhOneyz, Mr Domoz, Tak Dikenal, AnonxoxTN, Raka 3r00t, PirateX, Bl4ck Jorozz, Younes Lmaghribi, Indonesian r00t, BlackBase Hacker, CoderSec, h4shcr4ck, Mrlele, Donnazmi, TheGame Attacker, Man Rezpector, SaccaFrazi , Spec Tre, HusseiN98D, HolaKo, Mr.Ajword, Root Max, Egy Eagle, THE GREATEST, BiosTeRminat0r, Man Rezpector, Hani Xavi, Don Maverick, Psyco Hacker , Black Cracker, rummykhan, Root Max, VINUX, ARAFET, TITO_SFAXSIANO and SquiCk H4ck3r. 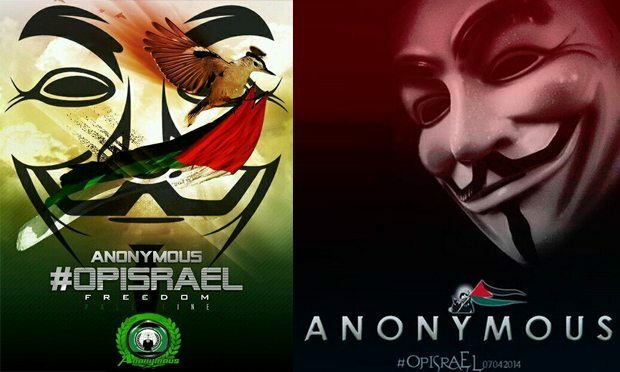 The ‘Anonymous’ has also been joined by ‘AnonGhost’ which is a well-known hacking group that has attacked Israel’s cyberspace successfully before as well. In March, ‘AnonGhost’ had crashed the website of Israel’s Ministry of Agriculture and Rural Development and leaked the usernames and passwords online. In response, Israeli hackers hacked and posted pro-Israeli content on OpIsrael.com, site believed to be used to carry out these attacks.